What is policy and how do we change it? On the cusp of establishing a Northland Food Policy Council (or whatever we might call it) I have stumbled across a book that has thrown a lot of light on the policy universe. In How Change Happens, Duncan Green shares his knowledge as a long-time advocate for change. The book is available for sale, but is also free on Duncan’s website. The complexity of the policy environment is perhaps best expressed in the author’s quote of former British Prime Minister, Gordon Brown. “In establishing the rule of law, the first five centuries are the hardest”. This poses a compelling challenge for New Zealanders. Our nation is less than two centuries old. But hopefully we aren’t in for another three centuries of hard work. After all, we have the legacy of tikanga, British law and a broader and deeper legacy pieced together over humanity’s long social evolution. The other emerging trend is toward greater local autonomy and self-determination. While hegemonic forces herd us like sheep towards a bland global consumerist culture, there is an encouraging shift in the opposite direction towards localism. Ideally, the most basic social unit, the family, will have autonomy to act within the broad parameters of evolving global policy. In the context of food, ideally families will have choice to eat food that nourishes without their perception being clouded by commercial considerations – especially the rapacious food and medical corporations that privilege profit over health and well-being. According to Google, pluralism is “a condition or system in which two or more states, groups, principles, sources of authority, etc., coexist.” In New Zealand, almost two centuries on from the birth of our nation we are struggling to come to terms with pluralism. Nineteenth century assumptions of European superiority created homogenising conceptions of right and wrong. Some are still clinging to a Eurocentric view of the world. From this perspective the only valid law comes from Western sources and the maxim “one law for all” dominates. Tikanga is itself pluralistic as it varies from place to place, and the authorities are the people of any particular location. Many Pākehā have struggled to accomodate tikanga in an unwavering belief in “one law for all” (as long as they get to determine who makes those laws). An example is the justice system. Although Māori constitute 15% of the population, they account for 51% of the male prison population. But attempts to develop the mare-based justice system are stymied by the “one law for all” mantra. Duncan Green observes that “customary (indigenous) law is often about making peace and reconciliation, rather than establishing guilt and redress” (page 104). Customary law can also be brutal. Duncan green advises us to both avoid a “west-is-best bias and a naive romanticism about the woking of customary systems” (page 106). However, we can achieve a greater synergy between these two traditions in ways that best serve local communities. Can you see a future where this is the case? Do you pass F. Scott Fitzgerald’s intelligence test? There are signs of hope as co-governance agreements between Māori authorities and the crown become more common. The recent determination of the Whanganui River as a legal “person” is an encouraging sign. Is this any stranger than a corporation being a legal person (as they have been for the last 150 years)? The interaction of the various actors involved in developing food policy in new Zealand will be greatly enhanced by Māori input. Ever since the accelerated alienation of their land in the mid 1800s, Māori have engaged in the struggle for justice, working through the courts and government. Their longer-term view of investment, focus on kaitiakitanga and commitment to retaining the land make them a powerful constituent of the food movement. This is an attempt to explore some elements of policy. More will follow. Our current food system doesn’t serve us well. My perception is that it has evolved into an ideal money making machine – for those who have positioned themselves to harvest the economic benefits. Most of us identify the dynamic below that would seek to lock us in to dependency on big players in the food and health industries. A recent report from the International Panel of Experts on Sustainable Food Systems identifies food system dynamics and advocates for a European Union Common Food Policy. In Europe, as here, there is increasing consumer choice around food purchases, but little choice around the food systems that produce that food and deal with its consequences. Problems are exacerbated by siloed thinking, conflicting motives, disconnected policy and self-interest. The need for new policy responses is made all the more pressing by the multiple crises now afflicting food systems in the EU and around the world, from burgeoning obesity to environmental degradation and pressures on farmer livelihoods. Our current political systems and policy frameworks are ill-equipped to address these crises. The policy tools affecting food systems do not respond to a set of agreed priorities. Instead, our food systems are the by-product of political compromises struck in various fora on the basis of various competing interests. The lack of a coherent food policy, cutting across sectors and joining up different levels of governance, means that accountability is hugely dispersed. When poor outcomes arise, no one can be held to account. With neither a pilot nor a flight plan, it is possible to ignore how badly food systems have veered off course (page 1). The report positions this problem as a major opportunity. This resonates with our Northland experience. Food is an entry point for joined up policymaking across multiple sectors and governance levels; sustainable food systems can provide a benchmark for actions in all of those areas. It is also a promising entry point for repairing democratic deficits and reconnecting European citizens with the policy measures put in place by their elected representatives (page 1). The report is part of a “three year participatory process of Research, Reflection and Citizen Engagement”. With little sign of our government showing such resolve, we are at least raising awareness of the dire need for food policy reform. Please help – the first step is to engage. You can read the report here. Northland’s EV champion was recently interviewed by Tim Lynch on Green Planet FM. Joe is seen around the North promoting electric vehicles, with strong support from NorthPower. His efforts are are bearing fruit as the number of EVs in northland continue to grow. You can hear his interview on the Green Planet FM website. The defeat of Labour leader Andrew Little’s procurement bill is another reason to have a regional food policy council. The bill, Our Work Our Future, proposed an amendment to the the Principles of Government Procurement, and the Government’s Rules of Sourcing to include two considerations, job creation and fairness. The Government’s focus has been on driving down expenses and multinationals, with their sophisticated systems and logistics, have been allies in that process. But if we factor in the negative externalities created by multinationals and the positive externalities created by fostering more local economic activity, any savings will prove to be minimal, or, false economy when total tax take is factored in. If we look back over time, a number of multinational food service companies have arrived and established themselves here. They have significant resources to secure a foothold in local markets. One strategy is to identify key staff from local competitors and poach them, with the combined impact of reducing the local competitor’s capability and providing the newcomer with ready-made networks. If they face significant local competition, they can draw on head office for support. These multi-nationals have been seeking long contracts to embed themselves. Once they have achieved a foothold and they are the incumbents – they have an advantage in future government tenders. Thus an unlevel playing field emerges. It would be nice to think that government policy is based on evidence. Our research into the Social and Economic Impacts of the Whangarei Growers Market, reveals a 2.99 economic multiplier when local food displaces food from outside the region. This fits within a multiplier range of 2 to 4 times reported internationally. The 2.99 multiplier is based on the grower to customer transactions at the growers market, but what if we add in more complex value chains, for example, food cooked in restaurants, and that includes dry goods sourced from local or national suppliers. And what if we factor in the health benefits as we foster a greater appetite for local food? These multipliers are the basis of the “sticky economy” – an economy where money circulates longer locally. By contrast companies owned offshore are more likely to extract money for dividends to shareholders, head office costs and offshore suppliers. You can see a video explaining the multiplier here. Kiwibank has a counter that calculates the quantity of bank profits lost offshore. This counter started from 28 October, 2016. You can get an update here. The total for the year to 31 March 2016 was $4.525 billion. Imagine if half of that money remained in New Zealand and we factored in the local multiplier. We don’t know how much of the Government’s $40 billion expenditure goes offshore, but with multipliers applied, this figure would be significant. It is very difficult to quantify these impacts in dollar terms, but the assumptions that support the rejection of this bill need to be challenged. I am not against globalisation and regard myself as a global citizen. But the shareholder ownership structures that characterise most of the foreign companies that operate here are driven primarily to extract profits for those shareholders. Economist Shamubeel Eaqub argues for a balance between globalism and localism. Let’s trade internationally, but do it intelligently. Enabling extractive foreign companies free reign here is not in our best interests. Murry Burns, one of the two founders of the Whangarei Growers markets featured on Radio NZ Bulletins today. He is commenting on the impact of food safety plans mandated by the The Food Safety Law Reform Bill. This was featured in an earlier post about artisan cheese makers. As discussed in the earlier post, a Food Policy Council would be a voice in policy for smaller food producers on this and related issues. 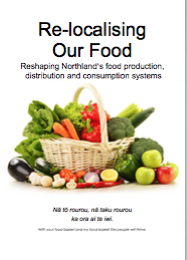 Local Food Northland are working on this now. Here is an image from Hydro Healthy’s Facebook Page. Nicki comments that “when there are frogs in the water, it shows how clean and pesticide free the water we grow in is”. Murry and Nicki have developed an innovative hydroponic system that integrates chooks and liquid composts into the growing media.